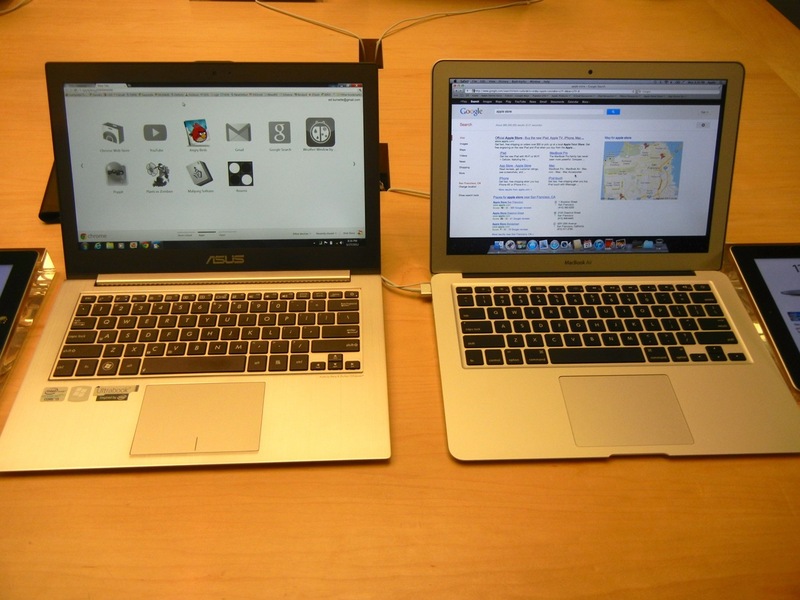 I bought a brand new Asus Zenbook Prime UX31 to take to the Google I/O 2012 conference, and after two days decided to scrap it in favor of a MacBook Air. Here's why. I bought the ZenBook because I normally use Windows and because the ZenBook has a much better display (1920x1080 IPS). It turns out this was both a blessing and a curse. My first hint of trouble was when I was first setting up the Asus and it turned itself off for no reason. That only happened once so I chalked it up as a fluke. Then YouTube videos showed only garbage in the Chrome browser. Turning off hardware acceleration worked around that. I spent several hours applying dozens and dozens of Windows Update patches. That was kind of annoying but it's just a one time thing. I don't understand why a brand new machine that only went on sale at Amazon this month didn't have those already applied, but no big deal. Another bad sign was the wrist pain I experienced when using the unit for the first half hour. The computer is so thin and the metal edges so sharp that it was actually painful to rest my arms on it. I trained myself not to do that and continued. The Asus lasted for my entire plane trip from North Carolina to California, including a delay on the tarmac as technicians tried to decide whether or not a dent in the engine was too big for flight or not. That was over 7 hours in battery saving mode, blogging via the in-flight WiFi. Battery-wise, I continue to be impressed. The real test came on Wednesday, the first day of the conference. I would be sitting in a straight-back chair for hours, typing furiously while trying to watch the presentations and take pictures at the same time. This is where the Asus totally let me down. I'm a pretty fast touch typist, but I absolutely rely on the computer behaving in a certain way as I type. In particular, I can't have the cursor jumping randomly around the screen, causing text to be inserted in the wrong place. I especially can't have text being selected willy-nilly so that the next key I hit will erase it. Both of these things happened with disturbing frequency on the ZenBook Prime. The culprit was the trackpad. Last year's ZenBook (non-Prime) got poor reviews because of its lousy trackpad. The Prime was supposed to be much better, according to several online reviews. Well, if this is better, I really feel sorry for the poor souls using last year's model. As I typed, despite my best efforts the bottom of the my hand would lightly touch the trackpad every so often. That was enough to send the cursor scurrying across the screen, sometimes with text selected, and always with unfortunate results. By the end of the day I had to keep checking the screen to see if I was typing in the wrong place. I can't count the number of times I had to press Ctrl+Z to undo, or retype text that was lost. Before you conclude that I just got a bum unit, consider that I found another ZenBook user at the conference who was having the exact same problem. Neither of us could find a setting that would make the situation any better. Both of us were extremely frustrated. Last I saw, he was still pecking out his articles on the ZenBook. I didn't have the same amount of patience. So, as soon as the sessions were over for the day I walked over to the Apple store determined to purchase a MacBook Air. I already ruled out a MacBook Pro Retina version because of the expense. Regular MacBook Pros were out because I wanted a solid state drive. That left the 13- and 11-inch models to choose from. You can see the 11-inch one in the picture above. First, the battery life on the smaller Air is rated at 5 hours instead of 7 hours for its larger sibling. 7 hours is just barely enough for my uses, but 5 would fall short without a mid-day charge. Plus there's the problem all laptops have where the battery life gets shorter over the life of the device. Neither MacBooks nor ZenBooks have replaceable batteries. Second, the 11-incher does not have a built-in SD port. My Nkon Coolpix S8100 uses an SD card, and it is convenient to pop it out of the camera and into the computer in order to import pictures. I could have gone with a cheap SD reader or plugged in a cable to the camera, but that's another piece to lose. Finally, the top and bottom rows of keys are shorter on the 11-inch Air than on the 13-inch. I tried each a few times (one of the benefits of having a real store) and decided I could definitely feel the difference, especially on the arrow keys which I use often. So, I'm now a proud MacBook Air owner. As I typed this article, I didn't experience a single glitch or cursor malfunction. The trackpad is incredibly nice on the Air, light years ahead of what the ZenBook has to offer. The keyboard feels rock solid as I bang out these words. 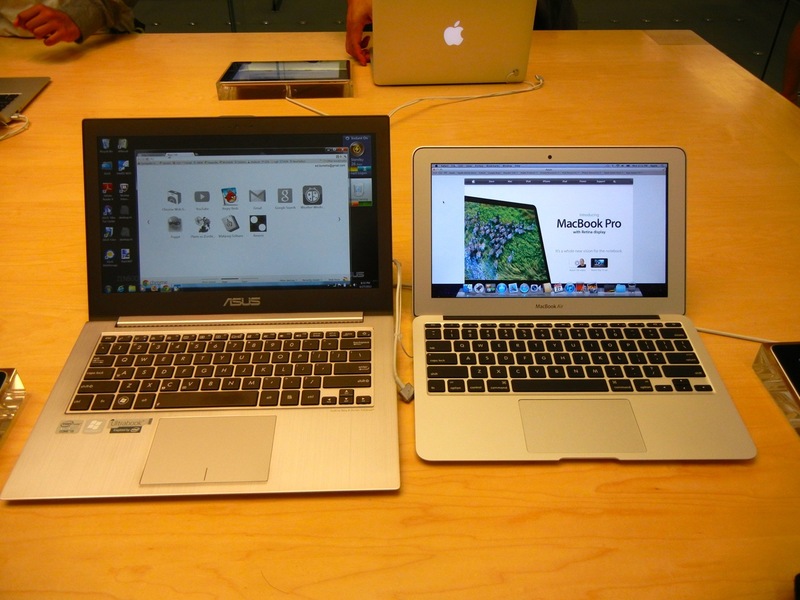 I hope Amazon will give me a refund on the Asus, because this MacBook is here to stay.